The presence of residual low-level linear birefringence in an optical component affects its quality, especially when used in polarization related instruments. 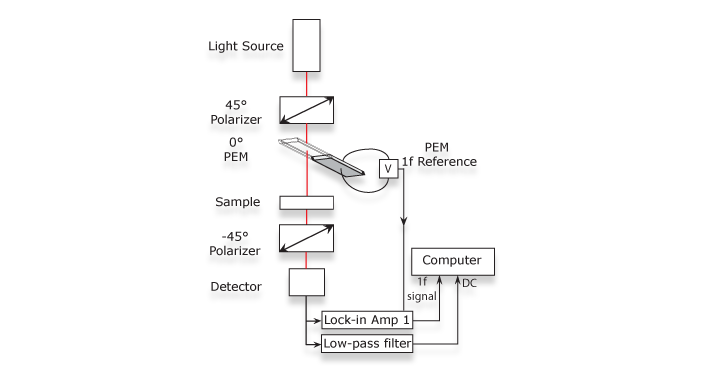 The PEM can be applied to the measurement of linear birefringence of transparent optical materials in several different ways. In practice, due to different amplification gains being used for the AC and DC signal channels, a calibration with a known birefringence is normally used. S. J. Johnson, “Simultaneous dichroism and birefringence measurements of sheared colloidal suspension in polymeric liquids," Ph. D thesis, Stanford Univ. (1985).